Its that time of year again, get your thinking caps on, guys, tis the season to be jolly and thoughtful. The Camera's Lying is on hand to give you some ideas of gifts for him, for her, for stockings or straight up gifts. Let me know in the comments which gift guides you'd like to see on here. For the guys is your life, be that Dads, partners, friends or brothers, I've got you covered for their stockings or small gifts. 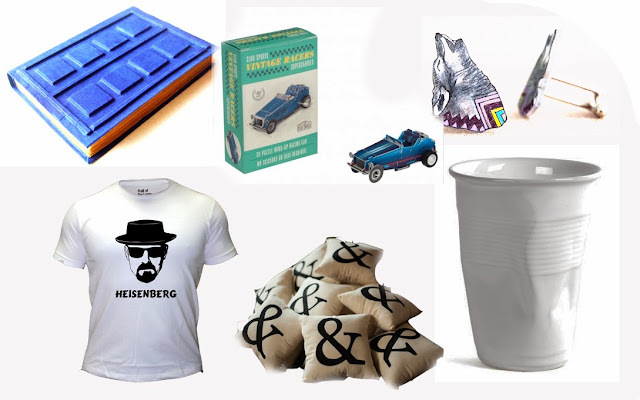 For the TV dorks, I picked this incredible 3D Tardis Notebook (a replica of the one Riversong totes), and a Heisenberg tee shirt for the wanna be meth chefs! I've also included cushions and cufflinks for the dignified man and a artsy crumpled paper cup (ceramic) mug and a 'make you own' wind up car kit for the cool, modern guys. What are your thoughts on my picks?